at the four-band Big Summer Classic. Forty-eight hours of Hippies in the High Falls. Tattoos, Hula Hoops and enough white-guy dreadlocks that, if you laid them end to end, would reach Jerry Garcia's room at the Mars Hotel. String Cheese Incident closed out Tuesday night's Big Summer Classic at the High Falls Festival Site. 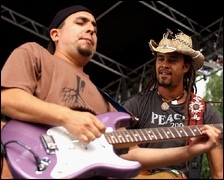 Joined by Keller Williams, Umphrey's McGee and Michael Franti & Spearhead, 3,100 Garcia Youth couldn't resist. Some were leftovers from the night before, when the groove phenomenon O.A.R. packed in 3,950 who looked barely old enough to wear their beer bracelets. That's 50 short of a sellout at the High Falls, although 3,100 also leaves little room for hacky sack. Youth and energy need more room than age and sedentary ways. It's free-range territory for any guy who wants to walk around in a red dress with white polka dots, wearing a horsehead mask. Or anyone who wants to sit on the concrete and draw with chalk. Anyone who wants to watch a portable-toilet mime. Or wear a huge padded suit and sumo-wrestle someone. And it's a place where someone can swipe the "Show I.D. Here" sign from a beer tent and position it over a "Do Not Enter" sign just right, so that it reads "Do Not Show I.D. Here." And this harmless desecration of authority stayed there all night, right above a large cardboard sunflower, simply because it was funny. Williams is the groove world's Pat Metheny, a Virginia guitar virtuoso who improvised his way through a set that sounded like a band, not one man, thanks to the array of pedals at his feet. Umphrey's McGee, which has a Sept. 9 date at Water Street Music Hall, is a mostly instrumental, Midwestern, '70s funk, prog-rock fusion of Frank Zappa decomposing the theme from Sanford & Son. Colorado's String Cheese Incident opened its set in unusual fashion: playing someone else's song. In this case, a jaunty Bob Dylan's "Just Like Tom Thumb's Blues." It's bluegrass with percussion, the Grateful Dead but twangier. And when the band came to the line about "howling at the moon," the crowd howled. the four-band show, stole the evening. It's rock played to a reggae beat, with Franti part dance-hall toaster, part Gil Scott-Heron. Revolution is on his mind. "Give the corporations some complications, y'all," he hollered. In his battered straw cowboy hat and dreads, he exhorted the crowd 30 yards deep to pump its fists in defiance of whatever was the song of the moment; beyond that 30-yard range, dancers looked for just a little room to move. He questioned greed and the need to "get their hands on the same green." "One Step Closer" was an end-to-violence plea dedicated to a friend killed in Iraq. Franti was rebellion you can dance to. But it wasn't angry, it was joyous. In answer to Franti's repeated questioning, yes, I feel good. Yes, I feel good. Yes, I feel good.